Talk about record shattering. 400,000 year old DNA has now been sequenced, and that quite handily breaks the previous 100,000 year old record. The only problem is that these ancient and archaic people weren’t staying where they were supposed to. Well, that’s “supposed to” according to the story we thought we knew. Obviously, we didn’t know, and ancient DNA is only beginning to tell the story, which isn’t at all like we thought it would be. Before now, Neanderthals were thought to have settled in the west, meaning Europe primarily, and Denisovans in the East, in Siberia. This is due to where bones have been found and the DNA sequenced from just a few. 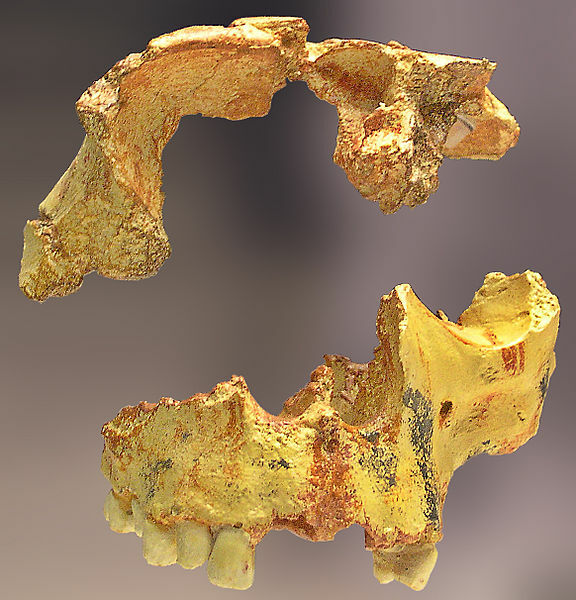 However, this new find from a cave in Atapuerca, Spain changes all of that. These people were not closely related to Neanderthal, who were later found in Germany, but instead are related to the Denisovans, their remains found some 4000 miles east, per mitochondrial DNA, meaning their direct matrilineal line. However, even though they are related, they are distantly related. Yesterday the mitochondrial sequence appeared on GenBank, after the release of the paper. According to Ian Logan, this new sequence has just over 500 mutations, about half of which can be matched with Denisovan and the other half are unique. So while the Denisovan and this new sequence do share a maternal ancestor, they are many, many generations distant. Of course, that would be expected, because they are about 350,000 years apart too in terms of time, or a meager 14,000 generations. What does this mean? The scientists don’t know for sure. Perhaps these Atapuerca Cave people were the ancestors of Denisovans and Neanderthals. Perhaps the Denisovan mitochondrial DNA “washed out” over generations in the Neanderthal or maybe not enough Neanderthal remains have been located and sequenced. Neither Neanderthal nor Denisovan mitochondrial DNA has been found in any living humans or relatively contemporary burials, meaning not outside of Neanderthals and Denisovans. In short, we need more skeletons and more DNA to reveal more information about our ancient ancestors. It opens the possibility that modern humans are but a small sprig on the larger and quite ancient Denisovan/Neanderthal Eurasian tree. We don’t know where modern humans fit in all of this, but according to autosomal genetic results, everyone with either European or Asian heritage carries some of them in all of us, just not the mitochondrial line. We are just beginning this journey of discovery. For more, access the Science article, Dienekes Anthrolpology Blog and John Hawks blog. The academic article in Nature, A mitochondrial genome sequence of a hominin from Sima de los Huesos, by Meyer et all is behind a paywall. This entry was posted in Ancient DNA, Anthropology, Archaic Humans, Denisova, Discovery, Mitochondrial DNA, Neanderthal and tagged General Information by Roberta Estes. Bookmark the permalink. Very interesting discovery. Thank you for sharing. How are modern africans related to modern europeans in terms of DNA? When I lived in Africa the antropoligists said that at the begining people living there weren’t the Bantú people that dominates today. There was Hotentotes and Bosquiman people before. But Bantú people expanded south of Shara desert when they discovered, developed or adopted agricuture. As they are very strong physicaly, this tech discovery allow them to expand and overcome Hotentotes and Bosquimans. Of course some mix should have occur also. I look forward to yr comments. The most ancient people are believed to be the San or click speaking people. Roberta, you said, “Neither Neanderthal nor Denisovan mitochondrial DNA has been found in any living humans.” Aren’t some companies advertising that they can discover if you have some of this DNA in your body? How is this done if there is none of this DNA in anyone living? Yes, that’s correct. They are testing autosomal DNA, not mitochondrial DNA. It’s the mitochondrial, or the direct maternal line, that has never been found in contemporary people. Every European and Asian has some autosomal Neanderthal or Denisovan or both.